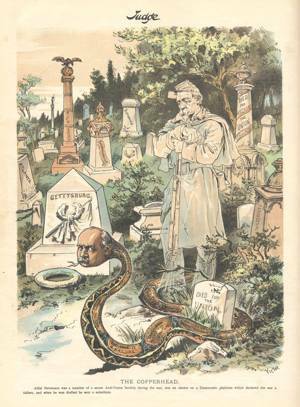 In this cartoon, Democratic vice-presidential nominee Adlai Stevenson is depicted as a dangerous copperhead snake, the nickname for Northern supporters of the Confederate cause during the Civil War. The image continues the longstanding Republican campaign tactic of “waving the bloody shirt,” which meant associating the Democratic Party with the Confederate rebellion. The Grand Army of the Republic, a large and influential group of Union veterans, was a key voting bloc for the GOP.